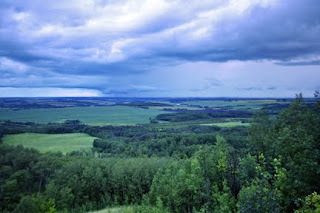 We drove east out of Kamsack on the highway to Madge Lake in yet another tumultuous summer storm-a double date with my brother Greg and his wife Jana. 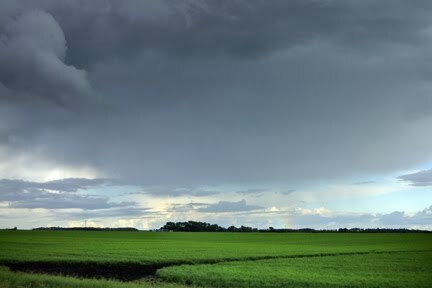 The prairie sky during storms like this is unrivaled for contrast and beauty. "Stop the car," I said. "I need to get that shot." 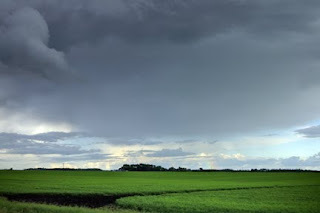 I hopped out of the passenger side, stood in the wet grass and captured the rolling clouds set off against the foreground of a lush green field. Then I turned around and snapped a shot of the huge barn that is still standing just a few miles out of town, on the Bielecki farm. The walls and roof are slowly peeling away, but it is still a sight to see. 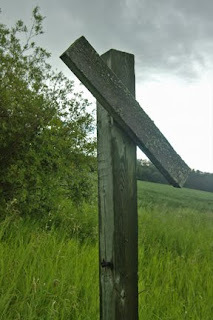 We drove north, just beyond Kendall Hill, stopping at an overgrown road leading to an old gravel pit. A cross grabbed my attention and I scampered through the supposed tick-laden grasses to snap a shot or two. Apparently my brother had gone for a run down this path and emerged riddled with 14 of the blood sucking varmits. 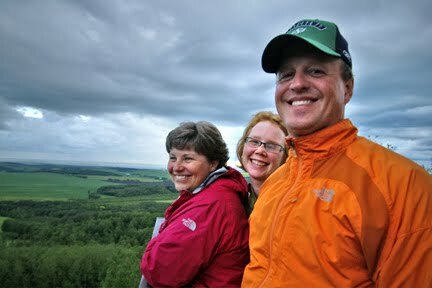 East we continued to travel, through the various subdivisions of Duck Mountain Provincial Park: Benito, Jubilee, Kamsack. Cabins of all shapes and sizes, some seasonal properties, some all-season permanent homes, I'm struck that even Kamsack has a shadow population problem. Some of the homes are absolute palaces, gargantuan mansions, likely priced in the $750K range, possibly higher. Living at the lake is a far cry more expensive than living in town, basic one-season cabins fetching at least a couple hundred thousand dollars. 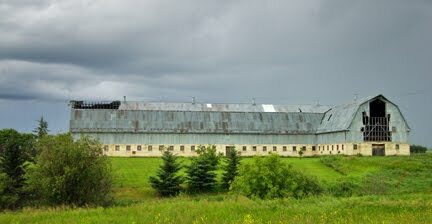 The people who choose to live at Madge, several of whom are friends and family, have children who attend school in Kamsack and they use municipally-funded facilities, yet pay no taxes. It's a dilemma. The Town of Kamsack website suggests that the current population is around 2,100 souls. I would suggest that the population would be much higher if you were to include the hundreds who have staked their claim on the 99-year leases offered by the provincial government around this renowned recreational paradise. As we drove back to town, we swung up to a hotel isolated up on the hill overlooking the pristine valley south of Kamsack-the Mee May Hillside Top Resort. A newly renovated property owned and operated by the Cote First Nation, it features an intimate dining area, a lounge and 10 rooms, moderately priced and exquisitely appointed. The view from the balcony is incredible, especially watching the summer storm shape-shifting across the horizon. They call Kamsack the Garden of Saskatchewan. Looking out across this vista, you can clearly see why. It is a breathtaking expanse, a view as lush and rich as any that you would see in the heart of the Okanogan or in California's wine country.